Fantasy "Glitches in the Matrix"; Immense Stretches of Baroque Magical Lands; and more! 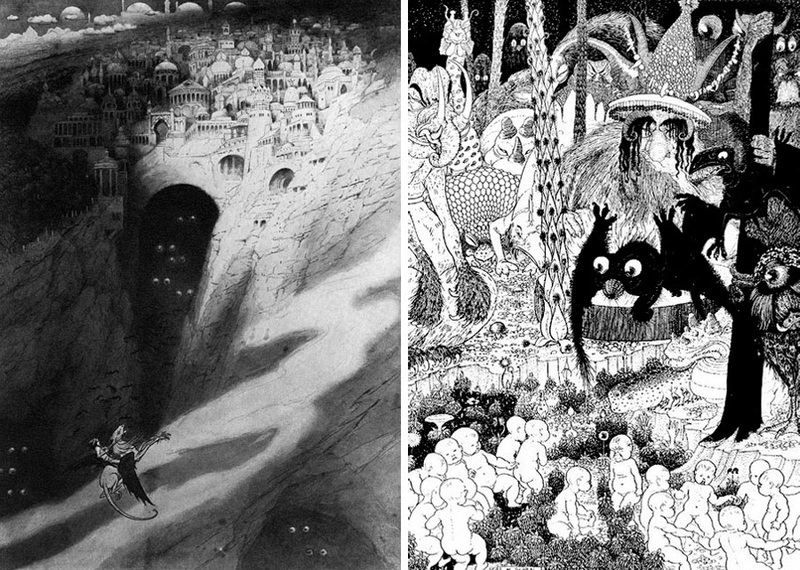 We wrote recently about epic space adventures here on Dark Roasted Blend, and now it's time to highlight the best examples of high fantasy and the "Unknown Worlds"-type of weird pulp tales. We are going to cover some rare and marvelous examples here, not as well-known as, say, J. R. R. Tolkien's Middle Earth, or C. S. Lewis' Narnia. Fortunately for those who are looking for pure and wondrous fantasy, there is enough lore and treasures to be found to keep one busy reading for months on end. The first really interesting example was not even published back in its day - it was perhaps intended for the "Weird Tales" magazine when it was written by legendary Clark Ashton Smith in 1940-1941 (it certainly has that special entertaining "weird pulp fiction" feel, plenty of good-natured humour and some appropriately sinister atmosphere). 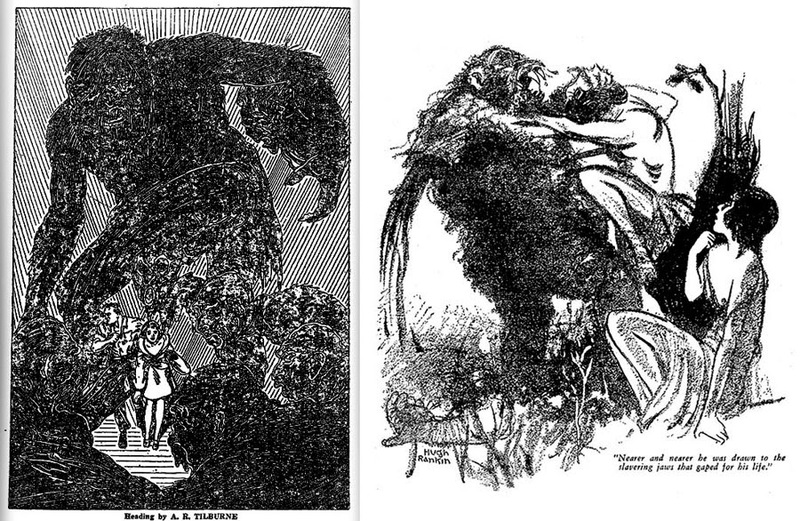 Not sure why it did not end up on pages of "Weird Tales" in the 1940s, but as we have it now, the story exists in three different versions - and in all of them human shadows have a ball mutating, morphing into independent creatures of half-light, mischief and very dubious intentions. The next find is a story by an even more mysterious writer, so mysterious in fact, that even Internet Speculative Fiction Database gets it wrong about who this person really was. According to researcher Douglas A. Anderson, Allison V. Harding (who published quite a few stories in "Weird Tales" in the 1940s) was none other than Lamont Buchanan, the associate editor of "Weird Tales" himself. His stories are not known as masterpieces of fantasy, but they do posses that special quality of thick, 1930s weird pulp atmosphere, comparable to works by early Kuttner, or even early Fritz Leiber. In this story the troublesome shadows again are misbehaving and acquiring the mind of their own, but in a more sinister way. If in Clark Ashton Smith's lighthearted urban environment they were cavorting and scheming around quirky and carefree, then here we have the heavy, ponderous, unspeakably vague shadows IN THE DARK WOODS. This is a great "cabin in the woods"-kind of scenario that would be exploited in many B-movies decades later. Now I have to hunt down more fiction by Allison V. Harding, which only exists within the pages of "Weird Tales" pulp and has never been anthologized, or printed anywhere else. "Shadows Alive" are not the only glitches in the world's fabric. There are also... spelling errors! Fredric Brown has written a hilarious tale of the world unraveling slowly, thread-by-thread - sort of like an experience from the "Truman Show" - because somebody in charge messed up the world's script, or admitted some spelling errors into the everyday run of things. I especially enjoyed the novella's first chapters where our poor hapless hero encounters things like an inexplicable (and highly confused) duck (as in "duck, the bird") inside a locked museum glass case, or worms that float up into the sky without going to all that trouble of turning into butterflies first. 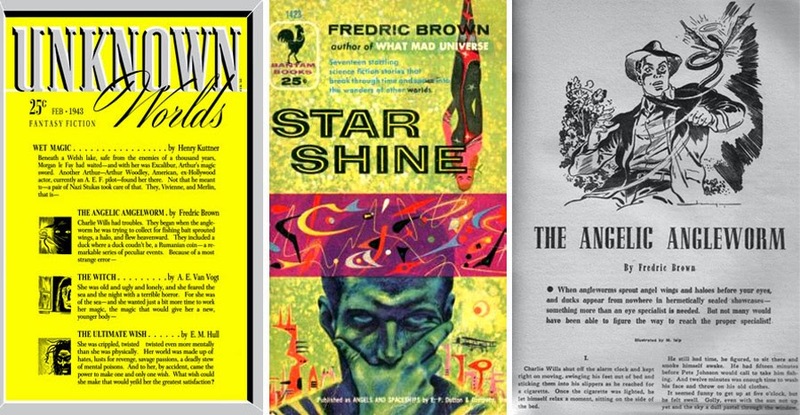 Fredric Brown's work in the weird pulps during the 1940s is highly recommended, with stories like "Come and Go Mad" or "The Geezenstacks" - and these were heavily anthologized, so will not be hard find. 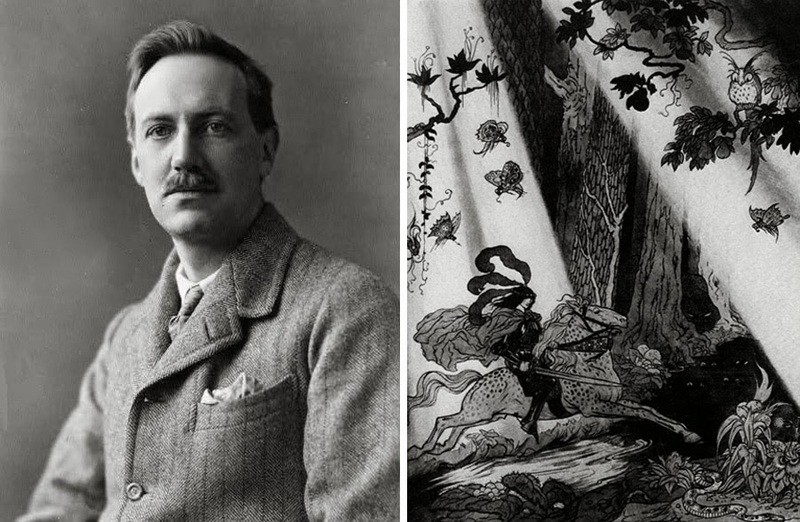 Speaking of Tolkien, the wealth of Dunsany's work (which is many books and more than a hundred tales) served as a powerful inspiration for Middle Earth, and not vice versa. 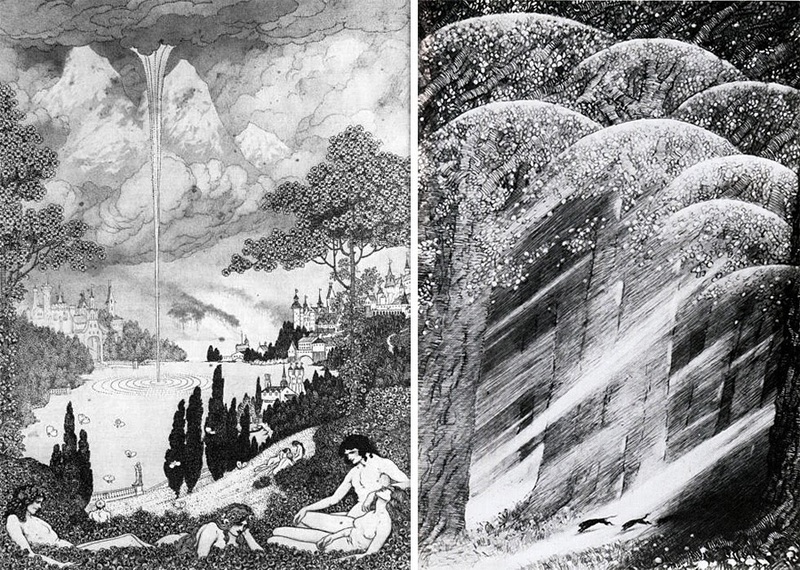 The world of Lord Dunsany is wildly fantastic, inherently beautiful, even though painted in broad strokes, sketchily realized (due to the immensity of the canvas) but nevertheless a fully enchanting and addicting environment - which, once tasted, cannot be forgotten. Reading this novella was a peculiar experience - a dream, or rather a trance, with sights floating by, wonder upon wonder, written in ornate, intensely descriptive prose; a narrative that - if you let it - will draw you in and leave you stranded inside this very dream. Which is exactly what happened to me. Can you believe it, I've never been able to finish reading it... Somewhere half-way along the quest the sheer weird beauty and the awe of thousands of wonders reached a critical mass in my head and prevented me from going further, prompting me rather to stop, to savour at length and to reflect on what I've read up to this point. Maybe one day I will try to read this book again, approaching it in a more jaded and indifferent way, and thus escaping a bizarre dream-like effect... But for now, all I can say is that nothing I have ever read before (not even Tolkien) produced such vivid images of strange worlds and stupendous exploration in my head. H. P. Lovecraft modelled this novel upon Lord Dunsany's magical tales, and it ended up to be perhaps the ultimate in "high imaginative calorie" food. It has a minimal plot, and fulfills exactly the promise of the title: it's "a Dream Quest in a Mysterious and Haunted Land" with elements of dark and high fantasy intermingled. A painting, perhaps? A symphony? Any of these things, but not a novel per se, rather - a haunting poetry.